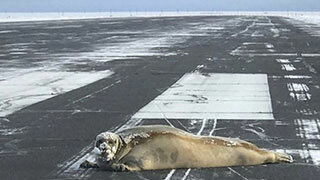 It was only a couple of weeks ago that we reported in this space that a 200-kilogram bearded seal had to be removed from a runway at an Alaska airport. This week it’s otters. A whole family of them was spotted on the tarmac at Singapore’s Changi Airport. "Changi Airport's surveillance system detected a family of otters that made their way into the airside early this morning," said the spokesman. 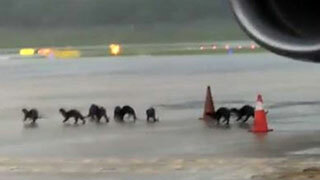 "The airside safety team was activated to guide the otters safely out towards Changi Beach." She added that there was no disruption to airport operations and said that otter sightings are a rare occurrence on the airport’s premises. "Besides regular wildlife patrols, a surveillance system is in place to prevent and detect foreign object debris, including wildlife," she said. The otters were likely seeking shelter from heavy rain, veteran otter watcher Jeffery Teo told The Straits Times on Tuesday. Teo, who has tracked Singapore's otters for more than five years, told the newspaper that the otters probably went to the airport as the canals were likely full due to heavy rain. Animal Concerns Research and Education Society deputy chief executive Kalai Vanan said it is "highly unlikely" that the otters may appear on the tarmac at night and disrupt flights as they are not nocturnal animals.